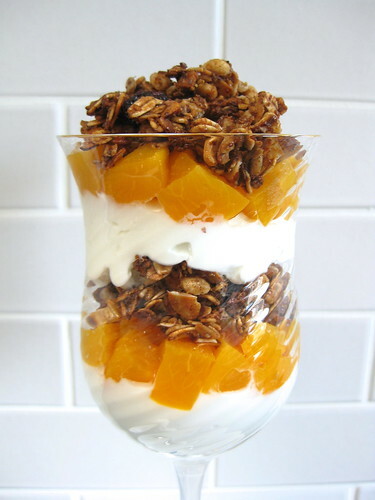 I’m so excited to share one, err, or two, of my favorite ways to use the fantastic, gluten-free muesli from Bob’s Red Mill: homemade muesli granola AND granola, peach and yogurt parfaits! Their muesli is such a fantastic mix of oats, puffy rice crisps, nuts, dried fruit and more that you hardly need to add anything else to make a delicious, crisp, chunky granola that’s perfect to start the day or simply enjoy by the handful as a quick snack. I always love to sneak a little flaxseed meal into my homemade granola, but not for the nutritional boost. Okay, not primarily for the omega-3s and fiber. My motivation: getting nice, big, crispy granola clusters without the use of egg whites! As for the seasoning, I’m going to ask you to trust me on this — five-spice powder may seem like an odd spice choice, but I promise you that the warm flavors of star anise, fennel, pepper (you really can’t taste it at all), cinnamon and cloves work so well with the toasted, lightly honeyed almonds and coconut. And once the peaches are added to the picture, oh my! Update 4/23: The giveaway is now over, thank you to all who entered. Congratulations to Jennifer M. — you won a case of Bob’s Red Mill Gluten-free Muesli! Disclosure: I was lucky enough to receive a case of gluten-free muesli from Bob’s Red Mill in order to develop this recipe — and after three weeks I only have one bag left, not a hint, but a testiment to how tasty it is. All of the other ingredients called for came from my pantry. And, of course, all opinons are my own! For the pictured granola, I didn’t go through the trouble to pick out (and set aside to stir in after baking) the dried cranberries and raisins. It’s not a 100% necessary step, but doing so really helps to preserve their flavor and chewy texture. Set oven rack on center level and preheat oven to 300°F. Line a small, rimmed metal sheetpan with parchment paper; set aside. Place muesli in a medium, heatproof mixing bowl. With clean hands, pick out the dried cranberries and raisins and set aside. Stir in sliced almonds, half (2 tablespoons, lightly packed) of the flaxseed meal and five-spice powder; set aside. In a small saucepan (2-quart) whisk together honey and canola oil. Set over medium heat and bring to a boil (it will be very, very foamy! ), whisking often. Remove pan from heat and whisk in the remaining flaxseed meal and vanilla extract. Pour hot honey mixture over muesli mixture, and stir well with a wooden spoon until the syrup evenly coats the dry ingredients. Pour mixture onto prepared baking sheet and press out into a single layer about 1/2″ thick (it will cover most, but not all of a 10″x15″ baking sheet. And the mixture should be cool enough to handle at this point, so you may lightly coat your palms with water to prevent the mixture from sticking and press it out by hand). Bake granola for 30 minutes, rotating the pan about half way through (don’t stir the granola! ), until evenly golden brown. Remove from oven and cool on the pan for about 30 minutes before breaking into chunks. Cool completely, stir in reserved cranberries and raisins, and transfer to a jar with tight-fitting lid. 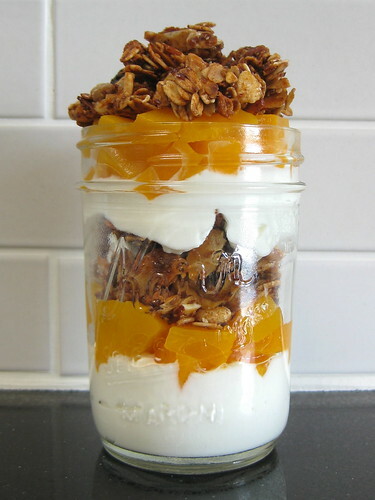 Store granola in the refrigerator to keep it crisp and fresh for a week (or more)! I had the hardest time scooping the yogurt into the glasses without smearing it all along the sides. To remedy this — and quickly achieve nice, clean layers — I pulled out a pastry bag and tip with large opening (Wilton 1M), and piped the yogurt layers into each serving dish. Feel free to substitute about 4 fresh peaches for the jarred variety when in season. Drain peaches and pat dry. Chop each half into about 1/2″ cubes; set aside. Scoop (or pipe using a pastry bag and big tip) about 1/4 cup (2 ounces) yogurt into the bottom of each of 4, 12-ounce glasses (or bowls or whatever you’d like to serve your parfaits in — the pictured 8-ounce jar makes it difficult to get a nice spoonful of all the layers at once, so I don’t recommend it). 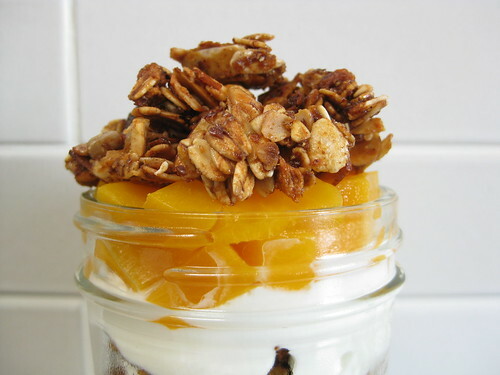 Top with about 1/4 cup of the chopped peaches and a generous 1/4 cup granola; repeat yogurt-peach-granola layering. Serve immediately, with a squeeze bottle of honey available (if desired) for folks to add a touch more sweetness to taste.